Power day at Eaglecrest! 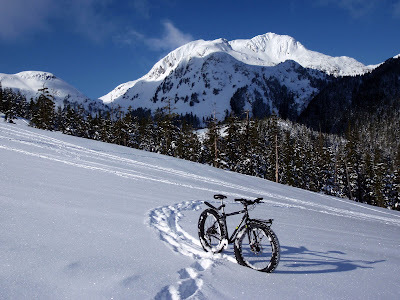 I didn't climb up there with the intention of riding the mountain, nor did I really have the time, but I did have the Pugsley, and a clear view of four inches of fresh snow swept over a firm base. 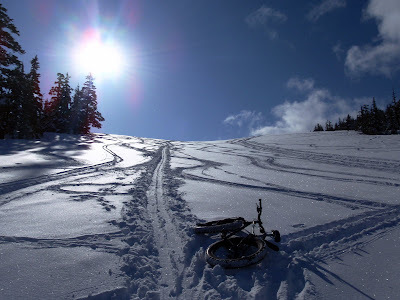 Some conditions are just too perfect to resist. Amazing how five minutes of a swooping, weightless, white-silent powder blast can absorb all the malaise of a 12-hour work day. I'm going to try to get up at 6:30 tomorrow. 6:30 !!!! that's crazy talk! I've recently started getting up earlier to take a longer cycle to commute to work and feel much brighter. Hope your toes are coming along ok.
Beautiful pix today. However, I must object to Pugsley not being properly featured in the first one. More Pugsley pls.